Device Sergeant allows you to to have macro style control of all devices in the mixer of the same name. In the picture I have added some Digital Filters (renamed to HP Filter). Use the dropdown to choose the parameter that you want to control in all instances at the same time. 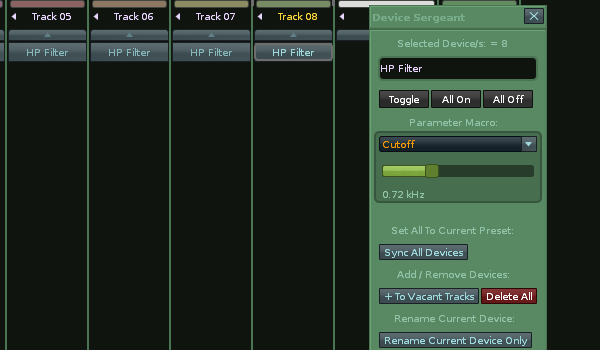 In the screenshot this means I can drag the slider and all the cutoffs for HP Filter will be modified together. [% ^] and [%v] buttons nudge the target parameters relatively, where the slider sets all values to the same. [Map Hydra] This button adds a Hydra device after the currently selected device. It then routes the selected parameter for all the devices selected by the tool to the Hydra--(Hydra Max-parameter-count is 9, so only first 9 devices can be routed). Added 4 new "nudge" buttons beneath the main slider. [Map Hydra] button added and small bug fixes.